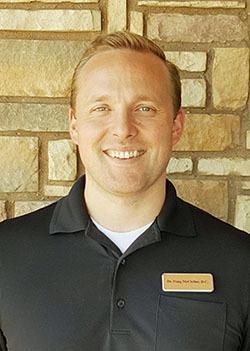 All Injury Rehab Chiropractic > Douglas K. McClellan, D.C.
Dr. Douglas McClellan is a board-certified chiropractor and holds a Doctorate of Chiropractic from Parker University. Dr. McClellan grew up in an Air Force family and spent several years in Texas, Virginia, Germany, Romania, and Mexico, amongst other places. Before completing his undergraduate education at Brigham Young University, in Utah, Dr. McClellan spent two years living in Ecuador, serving as a missionary for his church, and is fluent in Spanish. Upon graduation from BYU, Dr. McClellan moved to DFW to attend Parker University. There he completed his internship at the Parker Wellness Clinic and graduated with a Doctorate of Chiropractic. Dr. McClellan is certified in Sports Chiropractic and has a passion for educating his patients on how to stay active and healthy. Dr. McClellan and his beautiful wife Heather have a seven year-old son, a five-year-old daughter and a one year-old daughter who keep them on their toes. They are active in their church, community, and college football!